On the weekend of December 13-15, 2013, Bishop Daniel and three Seminarians of St. Sophia Ukrainian Orthodox Theological Seminary in South Bound Brook, NJ (Ivan Chopko, Volodymyr Sukanets Sr., and Volodymyr Sukanets Jr.) honored the St. Peter and St. Paul Ukrainian Orthodox parish in Carnegie, Pennsylvania with a visit. When His Grace arrived on Friday he had dinner with the teenagers at the hall. Following dinner they moved to the Church School rooms for an enlightening discussion. He talked about being a genuine person and not role playing or imitating others. Saturday was the St. Matrona Ladies Society 10th Annual Cookie Walk. His Grace and Seminarians had a "hands on" experience by helping to wait on customers and pack their boxes with cookies along with helping to serve the coffee/tea/hot chocolate in the upstairs of the hall to those who were waiting for their numbers to be called. His Grace waited on Carnegie Mayor Jack Kobistek and then had a discussion talk with him about our parish. Mayor Kobistek informed His Grace about the good work the parish does around the community. His Grace was pleased to see how many parishioners (young and old) worked together to make the Cookie Walk a success. One little girl was heard saying that she had to write a Christmas story about her favorite holiday tradition. She wrote about the past few years coming with her family to our Cookie Walk. She got an “A” for the story! In the early hours of afternoon, His Grace Bishop Daniel asked Iconographer Michael Kapeluck to open his studio for a tour and a brief class/orientation for the students of St. Sophia Seminary. The bishop along with the seminarians were treated to a detailed explanation about the iconography project upon which Michael Kapeluck is working for one of the Ukrainian Orthodox parishes in Canada. Later in the day, His Grace Bishop Daniel along with the Seminarians, Very Rev. 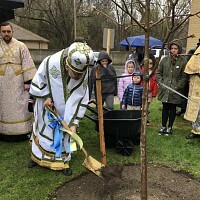 Steven Repa, and some of Metropolitan Constantine's relatives, held a memorial service at the gravesite of Metropolitan Constantine of blessed memory. Saturday evening the Parish Council went to dinner with Bishop Daniel and the Seminarians to a local restaurant. Following dinner His Grace held an informal discussion with the Council members. Some problems and concerns were discussed. His Grace stated that a parish that is also community-oriented is a thriving parish. He relayed his discussion with the Mayor and pointed out our community participation. Besides our Cookie Walk, Pysanky Sale, and Ukrainian Food Fest, our parish hosts a free Thanksgiving Dinner for the parishioners and community (this year we served ~250 dinners between those who attended, the take-outs, and 30 deliveries). Left over food has been donated to FOCUS Pittsburgh. We sponsor the St. John and St. Martin's Closet in which we collect new/gently used clothing and bedding and on the third Sunday of the month we put the clothing out and anyone from the community can come to chose clothing to take home. Parishioners other individuals and organizations from the community donate clothing. 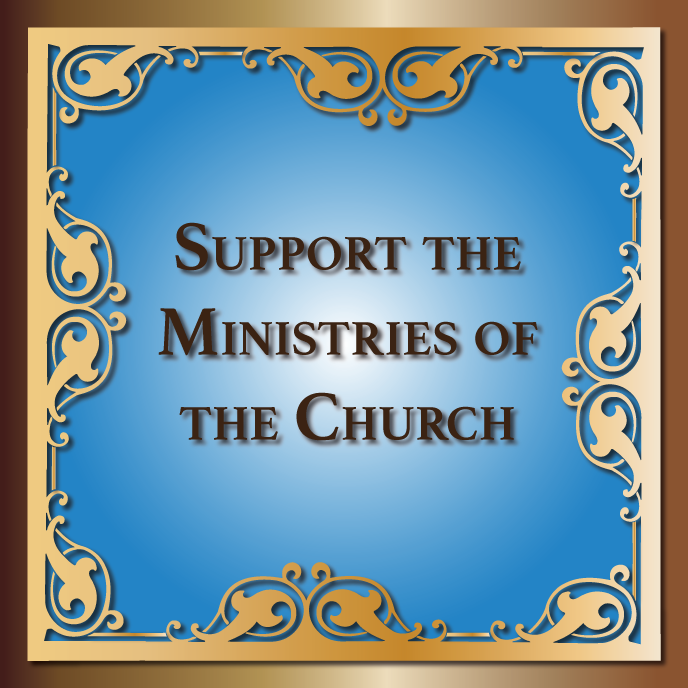 His Grace stated they have an overabundance of children's clothing at the Consistory (too much to send to the orphanages in Ukraine); we can come and get them for the closet. Two members volunteered to drive out to New Jersey and bring back the clothing. In conjunction with the Closet we have an Angel Tree in which the parents write out a wish list for their child(ren) and the parishioners take one or more angels to purchase gifts for the children which will be given out at the Christmas Party. Other activities include a Christmas Eve Supper in which Fr. Steve Repa, Dr. Steve Sivulich, and Alice Sivulich invite parishioners (especially those who are alone or have no place to go) to supper followed by Complines; a Theophany Eve dinner sponsored by St. Matrona's for all parishioners; and a Lenten Mission in which we invite a guest speaker and other local clergy. Sunday was a wonderful Hierarchical Divine Liturgy. It was very enlightening to have His Grace and the Seminarians serve. Assisting His Grace were Fr. Repa, Fr. Robert Popichak, Deacon Dennis Lapushansky, and Altar Servers. Responses were under the direction of Choir Directress Cynthia Mycyk. New vestments for Deacon Dennis and new altar cloths were blessed. Following Liturgy everyone proceeded to the hall for a delicious luncheon. While everyone was socializing Bishop Daniel met with a few parishioners in the Church who requested a meeting with him. When all was done His Grace and the Seminarians departed for their travel back to the Consistory. In honor of the three Seminarians and to thank them for visiting us the St. Matrona Ladies Society is sending a donation of $200 to the Seminary Support Fund. The parish is also donating $600 to the Seminary Support Fund in honor of Fr. Steve Repa's 30th Anniversary of Ordination into the Holy Priesthood. The entire parish thanks His Grace Bishop Daniel for gracing us with his presence and hopes he and the Seminarians can visit with us again in the future (perhaps to help with our Pysanky Sale). Parishes of the UOC of the USA Participate in Coats and Shoes Drive for Orphans! Metropolitan Antony Visits Los Angeles, CA! National Executive Sr. and Jr. UOL Boards Meet in Carnegie, PA!